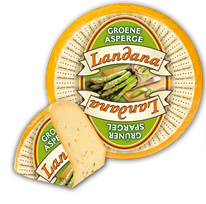 Landana GREEN ASPARAGUS surprises with a nice, delicate flavor and tastefully connects Dutch cheese with fine asparagus. A very special dainty for every gourmet. Silver Award Winner - Global Cheese Awards.